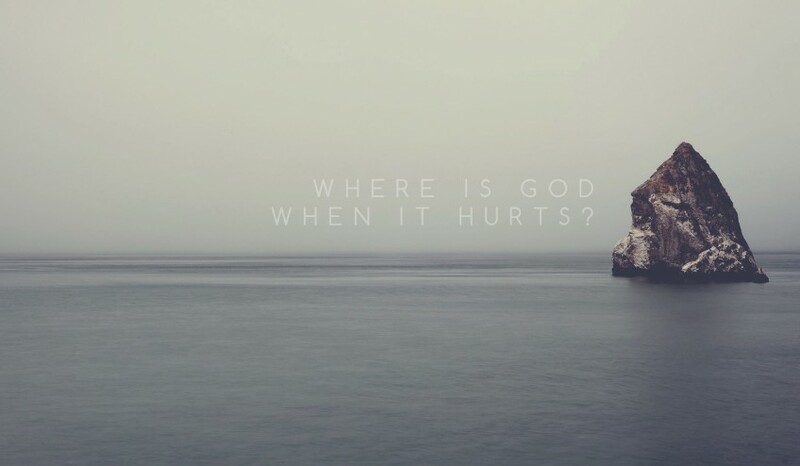 A couple of months ago I was sitting in a coffee shop reading a book, when a guy at the table next to mine turned towards me and asked, “What’s the answer?” Reading the confusion on my face, he asked me again and pointed at the book I was reading entitled, “Where is God when it hurts?” I had no idea how to respond to this stranger, knowing nothing about him or whether his question was sparked out of curiosity or if it was emotionally loaded! At the time, I gave a relatively short and light-hearted response (if there is such a thing to a question like that!) in an attempt to establish whether he was looking for a serious answer or not. After a brief conversation, his friend arrived and I went back to my book, lowering it a little to avoid being asked the question by someone else! Even though I have always been aware of the enormity of that question, that morning I realised just how hard it is to try and answer it. How do you communicate to someone that even when we hurt and we’re going through difficult situations that God is still good? How do you tell people who are in pain that God understands them? How do you express that God is sovereignly at work in the world when hundreds of people are killed and evil seems so tangible? In his book “Where is God when it hurts?” Philip Yancey addresses some of these issues. To fully explore these questions I recommend you read his book (he explores them in-depth and communicates them much better than I can!) but there are two things that I want to share briefly that particularly impacted me. The first thing that struck me was that the world is not the way God intended it to be. God created a perfect world. In his perfect world, God chose to give humans the power of choice. It’s the abuse of this human freedom that has resulted in pain and suffering multiplying on earth. All through the Bible we see references to God’s displeasure with the state of humanity. To judge God or his desire for humanity solely on the present state of the world is a mistake. I find it comforting as I endure hardship or look at what’s happening in the world today to know that God is not pleased with our planet’s present condition either! Another thing that stood out to me in this book was Yancey’s response to the question of why. Often, our first reaction to pain and suffering is to ask why. Why me? Why did it happen? Why did God allow it? Yancey notes that different people in the Bible ask God the ‘Why?’ questions, Job in the Old Testament and the disciples in the New Testament. However, instead of answering these ‘Why?’ questions and focusing on the cause of the suffering, Jesus consistently points them forward. He encourages them to look to the future and to ask ‘To what end?’ Yancey explains that this refocus helps us to stop dwelling in the past and encourages us to hold out hope that suffering can be transformed and used to display God’s work. Therefore, as I hurt or see others hurting, instead of desperately seeking a reason for it, I can look to the future to see how God’s work can be displayed even in the midst of difficult situations. This means I can choose to trust God completely, even if I don’t know why something has happened. Just like the guy I met in the coffee shop that day, I have no idea who you are or what you have experienced in your life. But, my prayer for you as you hurt or you see others hurting, is that you will remember life in this broken world is not what God intended for us. I also pray that when hard times come, you won’t get stuck in the past desperately seeking answers, but that you will learn to trust God and allow him to work in and through you as you look to the future. I am so aware that this article hardly scratches the surface of Yancey’s response to ‘Where is God when it hurts?’ If this is a question you have battled with, I really encourage you to read the entire book. Wendy is a primary school teacher and works part-time with the Ignite Network. The thoughts and views expressed in this are her own.